Find a missing husband for a lady in the Brewers Hall. (Optional) Hear rumors about a Skooma Eater gone missing. Kill the Corprus Stalker in The Underworks. Return Danar's Ring to Moroni Uvelas. The quest starts at the Brewers and Fishmongers Hall in the St. Olms Canton of Vivec. Talk to the ladies inside and ask for local rumors to hear that one of the ladies' husband has gone missing. 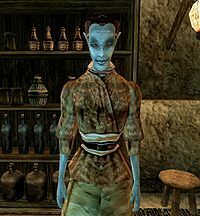 Ask people in St. Olms and you'll find out he's a skooma addict who used to loiter in the Underworks. 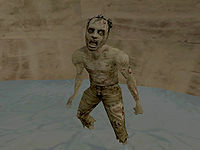 Go to the Underworks and in one of the connecting tunnels you'll see (or be attacked by) a Corprus Stalker. There is no way to rid him of the disease, so kill him and loot the corpse to find her husband's ring. Take the ring back to Moroni Uvelas to complete the quest and receive three potions of cure common disease. The title of the quest is likely a reference to one of Ernest Hemingway's most famous short stories, The Short Happy Life of Francis Macomber. The Journal may fail to update when you kill the Corprus Stalker, Danar Uvelas. To complete the quest, one must update the Journal via the Command Console. 10 While in the St. Olms area of Vivec, I heard rumors about a woman whose husband has been missing for days. The woman's name is Moroni Uvelas. 20 I have spoken to Moroni Uvelas about her missing husband. It seems the man was somewhat of a skooma addict, and the woman believes that in one of his skooma-induced wanderings, he may have contracted corprus. 30 I have agreed to try and find her husband Danar, and cure him if I can. He was last seen heading into the underworks near St. Olms. 40 Finishes quest I have decided not to become involved in this incident. The fate of a diseased skooma addict is not my concern. 50 I've killed a corprus stalker in the Underworks of Vivec. I fear this is what Danar Uvelas has become. 60 Finishes quest I returned to Moroni Uvelas with her husband's ring. She was saddened by the news of her husband's fate, but did not seem surprised. She was grateful that he was finally put to rest, and rewarded me with some potions of that will cure disease.